Today’s feature recipe is one that I hijacked from MixandMatchMama. She happens to be one of my favorite bloggers and I LOVE all that she does with cooking. Need a good bundt cake? She’s your gal. While doing a daily browse of her site, I came across this delicious recipe for Tortellini Taco Bake. At first I was skeptical. 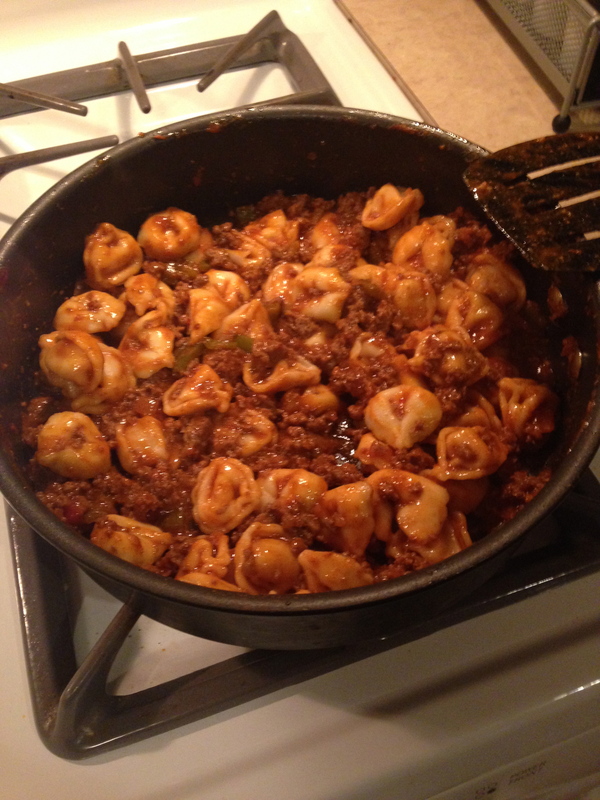 Tortellini and taco meat don’t sound like a great combination. However, mexican is my absolute favorite and I’ve recently learned that tortellini is a small bite of deliciousness. Well, I gave it a try and boy am I glad that I did. It truly was a yummy dinner. Even while cleaning up I couldn’t help, but sneak a few final bites. Cook the ground beef throughly. Add taco seasoning with a bit of water to help absorb all the flavors. When ready, add salsa to taco meat. The original recipe called for one cup, but I just eyed it up. Let that heat up. In the meantime boil water and cook your pasta. Add everything together when ready and enjoy. My one regret is that I didn’t use enough tortellini. Again, I was still a little skeptical as I wasn’t sure how the flavorings would be together. Also, next time I make it I’d definitely doctor it up with some olives, cheese, and even a dollop of sour cream. All in all in was a great meal and quick too.